Things have been a bit slow here at DreamInVertical over the last month or so. Life has been exceptionally busy and the climbing trips have been plentiful. We are pretty behind on trip reports and hopefully many will get finished over this holiday season. I finally completed writing my reflections and trip report from my first attempt on Freerider and, thanks to editing from Lizzy, it just went live. It’s a bit long, but hopefully a good read. As the year comes to an end, Lizzy just finished up her first quarter of grad school and I am in the process of changing jobs and moving to the Sunnyvale/Palo Alto area. Things are chaotic and I expect to get back to a more normal schedule come January or February. Back in November Lizzy and I attended the 1st annual #jtreetweetup. It was very cool to meet the many people that we chatted with online and help show them around Joshua Tree. Hopefully Lizzy or I will be writing a post from the trip soon. The highlight for Lizzy was a send of Gunsmoke! This has been a long time project and she has gotten quite close in the past. This trip she aced both cruxes and had enough endurance to finish it off. I was psyched to do a bit of exploring around the park in the mornings before meeting up with the Tweetup crew and found a new project. The Acid Crack features powerful thin fingerlocks to a core intensive face climbing section once the crack pinches down to tips. I worked the line twice on top rope and was able to figure out all but once section. This climb is steep and my style and I look forward to going back to it once I get a bit stronger. Over Thanksgiving break Lizzy and I went out to Indian Creek with a bunch friends. We meet up with people from all over and had a blast with amazing weather. Lizzy just finished her post and I will be writing about our trip soon too, since we both climbed exceptionally well. Definitely check out some of our photos here or even better ones from our friend Andre. 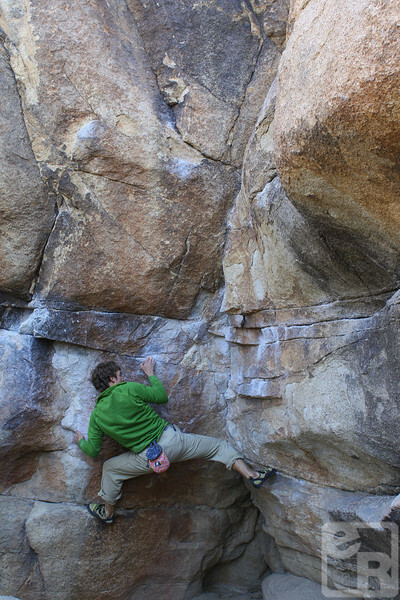 One highlight of the trip for me was seeing Matt Segal and Jason Kruk working on a new route at Battle of the Bugle. On our last day while driving past Battle of the Bulge we saw a few camera men above the project. We pulled over and saw Matt climb the last 15 feet or so and clip the chains for the first ascent. It was awesome to watch these guys work on this climb over the many days we were at the Battle of the Bulge. This new age line uses tricky face sequence to connect thin cracks with infrequent gear. On a final note, we have added a few new pages to DreamInVertical. First came our Gear Review section to allow people to more easily find our Sweet Gear reviews. As well the new Multi-Pitch Route Beta page has links to topos and trip reports from many of the classic multipitch and alpine routes we have done. This page is a work in progress so feel free to leave comments if there is something missing or some additional beta that could be added to future trip reports. Yay the Gunsmoke video was way awesome plus its good beta! Nice job! And Luke I hope the new job is going well. Luke, let me know the next time you head out to JTree. I’d be stoked to have someone trying acid crack with me.